Exciting secrets are waiting to be revealed in a new story arc set in a manor in the heart of Paris in the seventh book of this fascinating historical fiction series. 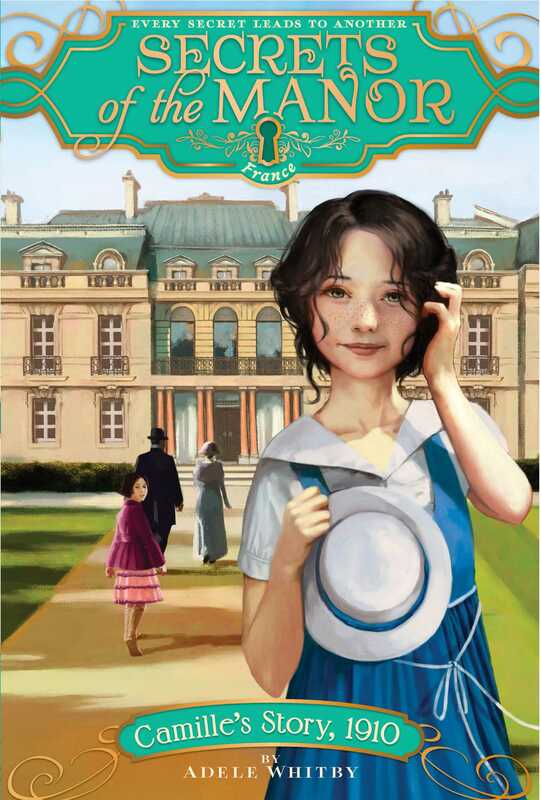 Camille LeClerc has just moved into the grand estate Rousseau—one of the largest and most beautiful manor homes in all of Paris—with her mother, the cook. Living in the manor is a dream come true for Camille and brings her closer to the wealthy Rousseaus, with whom she has always believed she shares a special bond, despite her mother’s constant urging to remember her place. Soon Camille is right at home inside the manor, and it’s not long before she stumbles upon family treasures that have been hidden away for many years. Treasures that might be the key to unlocking secrets of the manor’s past…and her own. Across the kitchen, Mama was whisking egg whites at a furious pace. “Is the butter melted, Camille?” she called. “All at once?” I repeated. I bit my tongue as I reached for the flour; Mama had helped me measure just the right amount. All at once, I reminded myself. Then I poured the flour into the pot. But I must’ve poured it a bit too fast, because a huge cloud of the stuff rose into the air! The scullery maids started to giggle—and who could blame them? My shenanigans at the stove were a constant source of entertainment for the entire kitchen staff. But I knew that they didn’t mean any harm by their laughter. After all, I’m sure I made a funny picture, now that my dark, chestnut-brown hair was as white as a powdered wig! “Are you all right, Camille?” Mama said. “Yes, Mama. I’m fine,” I replied as I tried not to sneeze again. I focused all my attention on stirring, stirring, stirring the gooey mix in the pot. Mama was trained as a pastry chef by her father, Alistair Beaudin, a famous chef who was known throughout all of France for his delicious desserts. The Beaudin family method for making light, delicate profiteroles was a carefully guarded secret, and just one of the reasons why Monsieur Henri and Madame Colette Rousseau had been so eager to hire Mama when she had finished her apprenticeship. Mama had been just as eager to accept their offer of employment, since she and my father, the groundskeeper at Rousseau Manor, were engaged to be married. Monsieur Henri used to joke about what a perfect match it was, bringing together two sweethearts and satisfying his sweet tooth at the same time. But he had stopped making that joke after Papa died. Mama and I still missed Papa terribly, but Monsieur Henri and Madame Colette had done everything in their power to ease our pain. Since they had no children, the Rousseaus had dedicated their ample time and fortune to helping others, including Mama and me. Just after Papa’s death, the Rousseaus had promised that they would always take care of us, no matter what. And in keeping that promise, they had earned our loyalty—for life. It was a privilege to work at Rousseau Manor, one of the grandest homes in all of France. The manor, and the estate it sat on, had been in the Rousseau family for generations. Ever since my tenth birthday almost two years ago, Mama had been trying her best to train me in the pastry arts so that I, too, could carry on the Beaudin family tradition. But despite my heritage, I was a disaster in the kitchen! Somehow, though, Mama had limitless patience with me. And if she wouldn’t give up, then I wouldn’t either. I stirred and stirred until my arm began to ache. Then, like magic, it happened: The sticky flour and buttery water combined to make a smooth, shiny dough. “Well done, Camille!” she said proudly from across the kitchen, and even the scullery maids began to applaud. I beamed with pleasure. “I won’t,” I promised. Then I ducked into the pantry for the eggs I’d gathered. Since spring had arrived, the hens had been laying even more eggs than usual; I’d already collected two large baskets and it wasn’t even noon! I wouldn’t be a bit surprised if Mrs. Plourde, the cook, decided to make a quiche for luncheon. I held out my apron skirt to make a pouch for the eggs as I counted them, one by one. As I gently placed each egg in my apron skirt, I heard a sharp voice say my name. My heart sank. I knew who it was right away: Bernadette, the head housemaid and one of the most powerful servants at Rousseau Manor. Bernadette was quick to find fault, especially with me. She was always displeased with how I folded the napkins or scoured the pans. Even my thick hair, which resisted all my efforts to stay in a tidy plait, seemed to offend her. I nodded miserably. It was no secret that croquembouche, a tall tower made of airy profiteroles filled with creamy custard and held in place by a sticky caramel sauce, was one of the most challenging desserts to make. Even I had to wonder what Mama was thinking when she asked for my help. “Then you’d best get on with it,” said Bernadette. She folded her bony arms across her chest, and I could tell that she intended to watch every single thing I did. What if the dough is still too hot? I worried. I snuck a glance around the kitchen, but Mama must have stepped out. “Get on with it, I said,” Bernadette snapped. I touched the side of the pot. It still felt warm . . . but was it too warm? Oh, how I wished that Mama would return! But one look at Bernadette’s stern face told me that I didn’t dare delay. I took a deep breath and cracked an egg as carefully as I could. Even so, a fragment of the shell tumbled into the pot. I reached in quickly to retrieve it, hoping that Bernadette wouldn’t notice. But she did, of course. She noticed everything. “I cannot imagine that Monsieur Henri wishes to eat eggshells in his croquembouche,” she said pointedly. “No,” I murmured as I began to whisk the egg into the dough. I focused all my attention on the mound of dough. With each stir, the egg should’ve disappeared more and more—but instead it began to clump together. My heart sank. It was obvious even to me that I’d made a mistake and added the egg too soon. Just then, thankfully, Mama returned to the kitchen. As she hurried over to us, there was hardly a trace of the limp she had from breaking her ankle last winter, but I knew Mama did everything in her power to conceal the truth: Most days her ankle hurt more than she wanted to admit. “Indeed, she does!” We all turned around to see that Madame Colette had entered the kitchen. She looked beautiful, as always, with her silver hair twisted into a soft chignon at the base of her neck. Bernadette, Mama, and I all curtsied at once. “Thank you, madame,” I said with a curtsy as Mama passed me a damp cloth to clean my face. “Yes, madame, and thank you for your time,” Bernadette replied as she led Madame Colette to her office across the hall. As soon as they were gone, I breathed a sigh of relief. As I began to measure more water into another pot, I realized that Bernadette had left her office door open. I could clearly hear every word of her conversation with Madame Colette. How odd, I thought. Bernadette always shuts her door. I tried not to eavesdrop, but it was impossible to ignore them as they chatted about Rousseau Manor’s staffing needs. Then Bernadette said something that caught my attention. Madame Colette said nothing, but I could picture the look of concern that had surely crossed her face. All through last summer and fall, into the winter, the rain had poured—more rain than anyone could remember falling before. By the time January arrived, bringing with it even more rainstorms, the River Seine had begun to rise. The sodden ground could hold no more water, and it oozed up through pipes and drains, until nearly all of Paris was flooded. In some places, all that could be seen were the tops of the trees! It was a slow flood; the muddy water rose with the pace of molasses, providing enough time for most Parisians to escape to higher, dryer ground. To many people who lived on country estates at the edges of the city, the flood was a marvelous spectacle to gawk at. They traveled to the heart of Paris just to see the buildings underwater, the rickety bridges that supported daring escapes, and the fireboats sailing down streets where horses used to pull buggies alongside clattering automobiles. The Rousseaus, however, would never be so coarse as to enjoy the misfortune of others. At news of the first survivors to escape from the flooded city, they had opened the doors of Rousseau Manor, welcoming as many people as the servants’ quarters could hold. Yes, it was crowded; yes, the workload had never been greater (especially for those of us in the kitchen); but I couldn’t have been more proud of Monsieur Henri and Madame Colette. Their generous spirits were an inspiration to us all. “How can I help?” Madame Colette asked Bernadette. “What about the groundskeeper’s cottage?” Bernadette suggested. I clapped my hand over my mouth in surprise. The groundskeeper’s cottage? That was where Mama and I lived! Of course I knew it was a luxury—a true indulgence—that the Rousseaus had allowed us to stay there even after Papa died. And I knew that we had no right to expect such wonderful accommodations—a cheerful two-bedroom cottage with its very own kitchen, separate from the manor, when the rest of the staff shared rooms in the attic. But that little cottage was our home. It was the only home I had ever known. Just then Mama returned from the courtyard. “Camille, I—” she began to say. But I held a finger to my lips before she could continue. Where were Mama and I going to live?